Goal: Setup a WanLink with an alternate queue discipline. 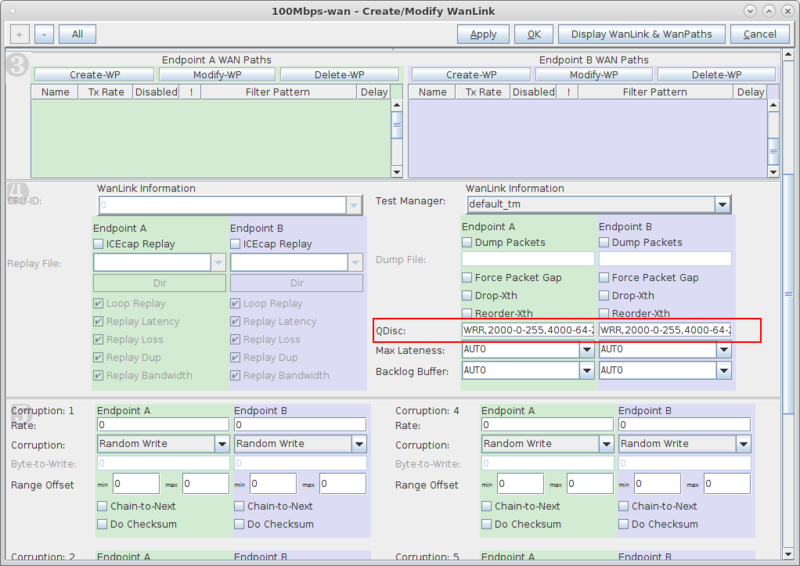 In this test scenario, the default WanLink queue discipline of FIFO (First In First Out) is replaced with WRR (Weighted Round Robin) to demonstrate how to setup queuing that will prioritize traffic flows based on IP ToS. 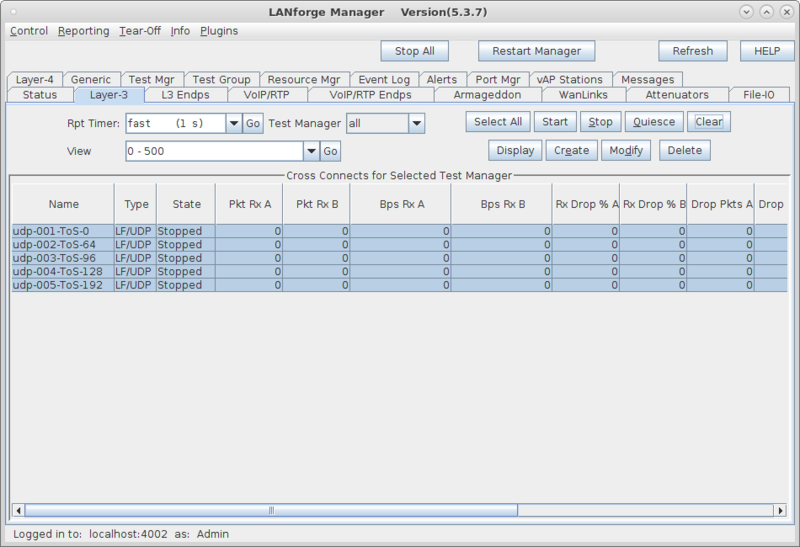 Note: WRR can only be used with User Mode WanLinks. 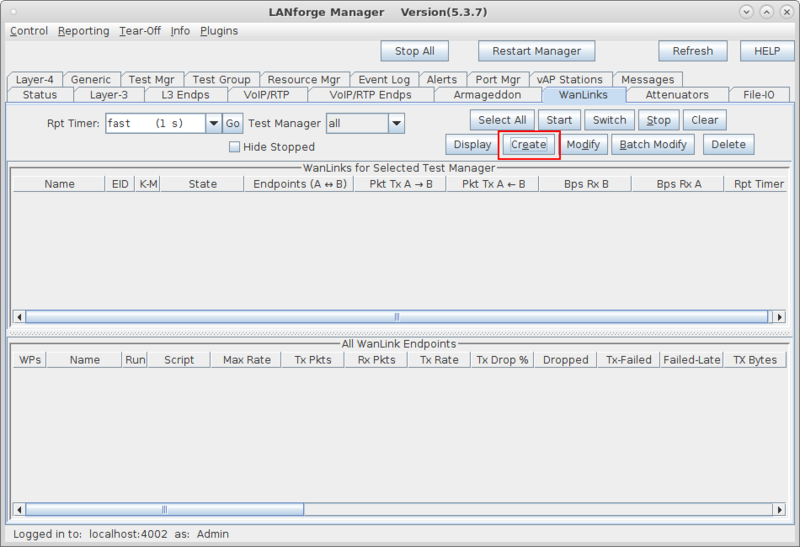 Go to the WanLinks tab and select Create. These impairments will be applied to all traffic on the WanLink. Select Apply to create the base WanLink. Setup WanLink for User Mode. 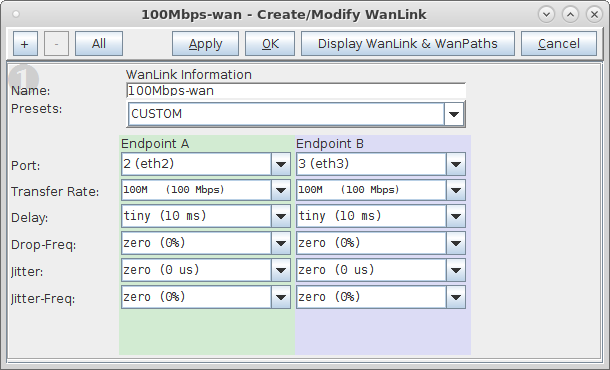 Select All to un-hide the other WanLink config panels. In panel 2, un-check the Kernel-Mode box. Select Apply to change the WanLink. Demonstrate the FIFO Queue Discipline. 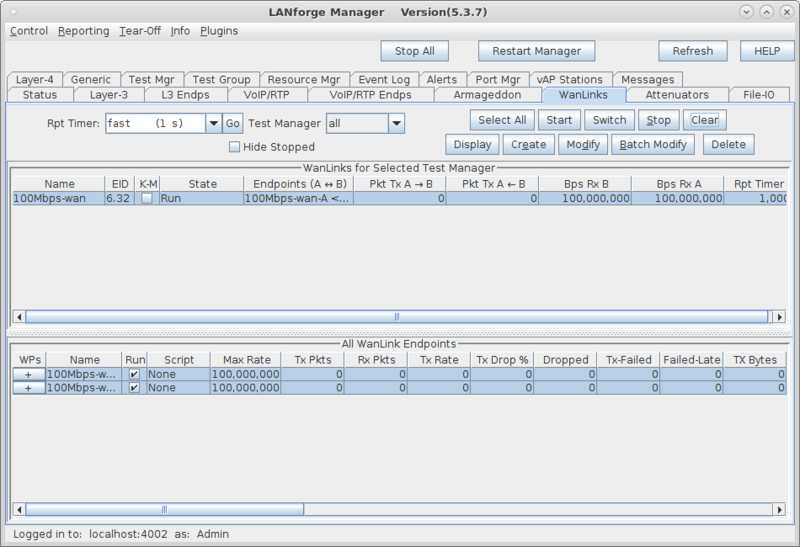 Start the WanLink, then run traffic through LANforge-ICE ports eth2 and eth3. Here we are using LANforge-FIRE on a secondary resource to over-subscribe the 100Mbps WanLink with five 30Mbps traffic flows each with a different IP ToS value set to show that the FIFO WanLink ignores the ToS bits by treating all packets equally and processing them in the order they enter the queue. The dropped packet percentages show that even with a high value ToS, no priority is observed. Change the WanLink queue discipline to WRR. 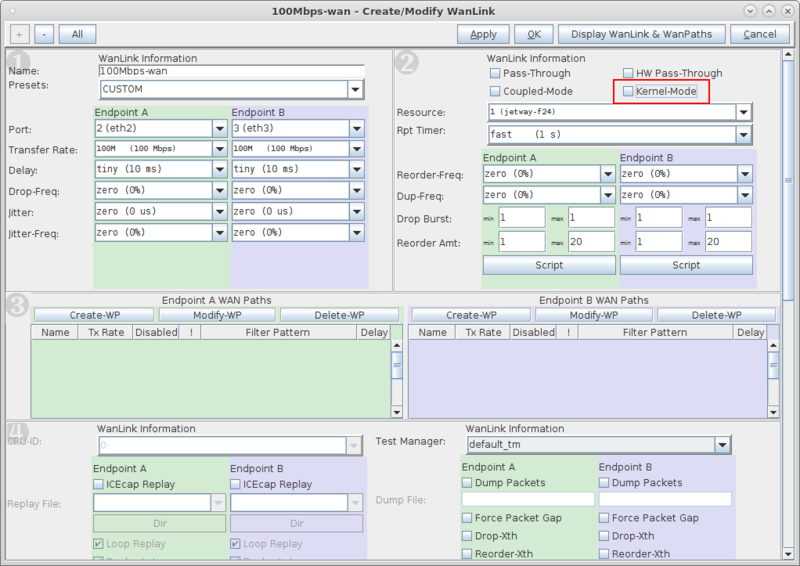 Select the Stop All button to stop all connections, then Modify the WanLink. WRR,2000-0-255,4000-64-255,8000-96-255,16000-128-255,32000-192-255 for both Endpoint-A and Endpoint-B. The WRR string format is weight-ToS-mask where higher weights are given higher priority to packets matching the ToS and bit mask. Note: Minimum weighting should be equal to or greater than your MTU. 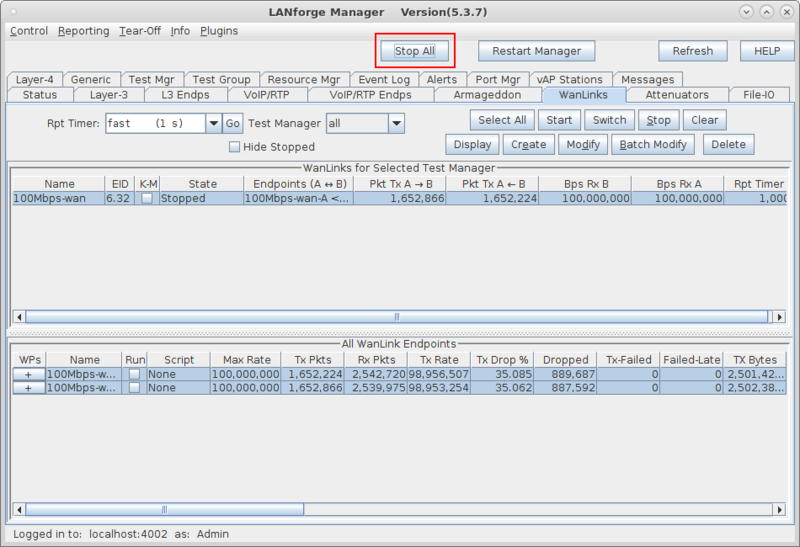 Select OK to apply changes to the WanLink and close the modify window. Demonstrate the WRR Queue Discipline. 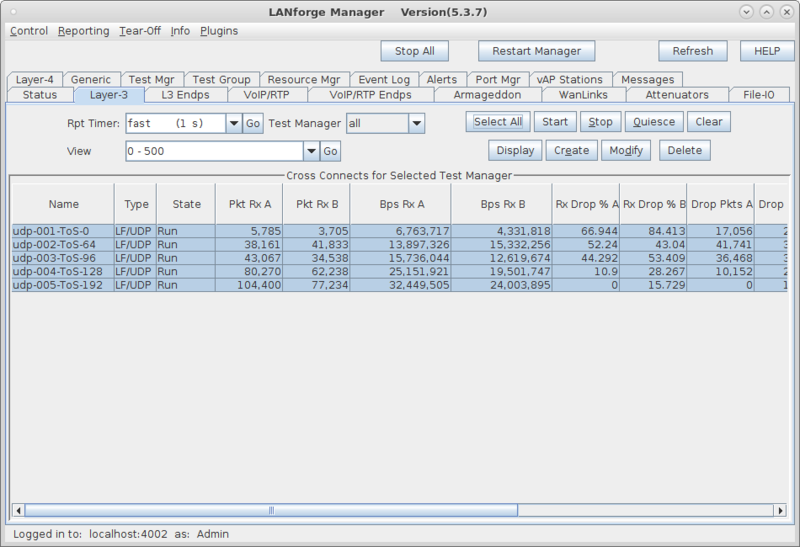 Run the WanLink and the same five UDP traffic flows through LANforge-ICE ports eth2 and eth3. This time, the higher valued ToS UDP flows are experiencing less drops due to the WRR priorities setup in the WanLink.